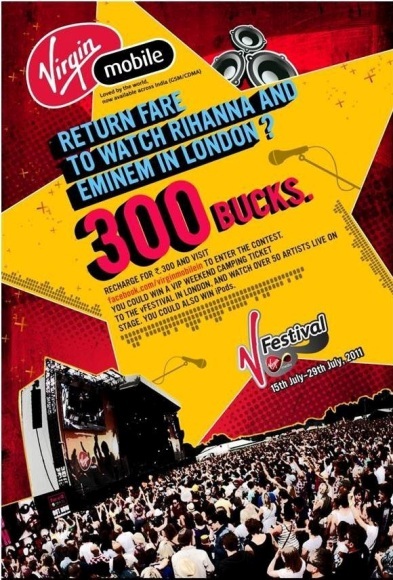 Virgin Mobile India Limited is organizing a contest in which you can win return fare tickets to watch the V Festival in England with VIP camping arrangements. What is the V Festival ? Well the V Festival is held near London during the penultimate weekend in August. The event is held at two parks simultaneously which share the same bill; artists perform at one location on Saturday and then swap on Sunday. The sites are located at Hylands Park in Chelmsford and Weston Park in South Staffordshire. To enter the contest, visit www.facebook.com/virginmobilein and share your craziest experience at a music fest or a concert and win VIP weekend camping ticket to London. There are also 3 passes that will be given out to Virgin Mobile customers, so if you are a Virgin customer you stand a better chance to grab your tickets to V Festival. Non Virgin customers can enter as well.